So Saturday morning came around 5:45am and I thought, "yes stay in bed all day, you have no commitments. you can go to the market, read a book, shave your legs, organize your hard drive" and next thing I knew I was shuffling about for a swim suit, sunscreen, yoga pants, and shades. I jumped in the shower, shaved my legs (1 thing off my original list), cut up mangos, smelly French cheese, and celery-because that was all that was in my fridge- and before I knew it I was on the road. Lewes, DE my favorite non-exotic exotic location. Quick stop at Food Lion for some water and a People magazine and I was there, at the end of the 404 right by the Dairy Queen on the beach by 8:30. Beach wedding. Charming? Well.....Lewes, DE is as mentioned before not exotic. It is the first city in the first state but the sand is rough, the water is murky, the Ferry is constantly honking upon its arrival or departure, and if you get married here you might have the lifeguards doing their morning bikini clad run right behind the priest during your ceremony. But thank you for choosing this destination, it made my Saturday morning more eventful than planned. I was 15 feet away observing from my towel. 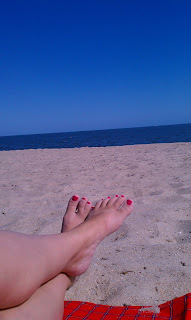 Glad I'm not the only one that just HAS to take a picture of my feet at the beach!! Yeah.. wouldn't be to fond of bikini clad anything crashing my wedding!